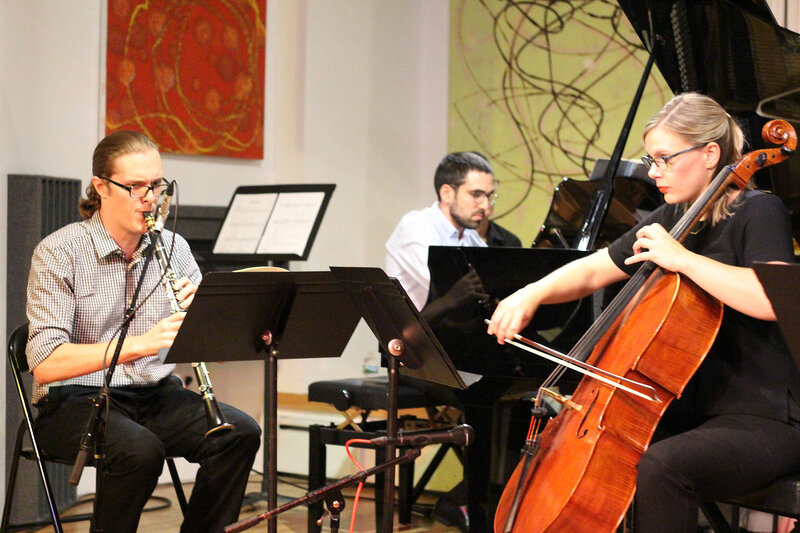 Unheard-of//Ensemble will perform Messiaen’s timeless work as a tribute to the place where many of New York’s great new music ensemble’s and new works got their start. Ford Fourqurean (clarinet), Lauren Posey (cello), and Daniel Anastasio (piano) form the core of Unheard-of//Ensemble, a modular contemporary chamber ensemble dedicated to development and performance of new music by living composers. Highlights of Unheard-of//Ensemble’s 2016-2017 season include the premier of six new works for clarinet, cello, and piano as well as four new works for clarinet and electronics. The ensemble performs at some of New York’s trendiest new music venues including at the Firehouse Space, MISE-EN_PLACE, and Scholes Street Studio as well as many others. Other notable highlights include a residency at Marywood University and the Unheard-of Tour, a weeklong tour, teaching and performing at universities and colleges across the east coast including Columbus State University, Chattanooga State Community College, Covenant College, and many others. Unheard-of//Ensemble collaborates with composers at the forefront of modern music to create projects that connect with new, diverse audiences. Based in New York City, the group is committed to the idea that new music belongs in every community and hopes to expand this ideal through touring, outreach, and an internet and social media presence to connect with both audiences and young artists throughout the country, focusing specifically on bringing new music to unheard-of locations generally out of reach for most new music organizations. The aim of extensive touring and interaction with new audiences is to both preserve contemporary classical music and to disseminate this new repertoire to a larger public viewership. As both performers and educators, the ensemble mentors and works with students, not only focusing on performance, but also the role of entrepreneurship as a professional musician in the 21st century. During the 2015-2016 project year, Unheard-of brought six new works for clarinet across different mediums to Alabama, Georgia, Pennsylvania, New York, and Texas with performances at the University of Alabama- Birmingham, Marywood University, University of Tennessee- Knoxville, Tarleton State University, and Troy University as well as radio features on 89.3 Montreal, 90.1 WUSB, and Clarinet Corner, the country’s largest clarinet radio program. The project also connects with communities through outreach at local cafes, schools, and unique venues to reach new audiences. Unheard-of is a sponsored project of Fractured Atlas, a non-profit arts service organization.